It started with heat-seeking-missile Dane Dobbie clearing Zack Porter’s sinuses via a first-minute, one-sided collision. And ended with celebratory Curtis Dickson, his Superman cape back to full flow, getting in the grill of defender Matt Beers, sparking a melee. “But that shows the parity in the NLL. Really does. Look at the standings in the West. It’s still all over the map. “We just kept grinding and grinding and eventually ground it out. Surrendering one – yes, a measly one – goal over a nearly 50-minute stretch, the ‘Necks, by turns abrasive and unyielding, put paid to a disquieting three-game National Lacrosse League losing streak, trimming the Vancouver Warriors 8-5 at the Scotiabank Saddledome. 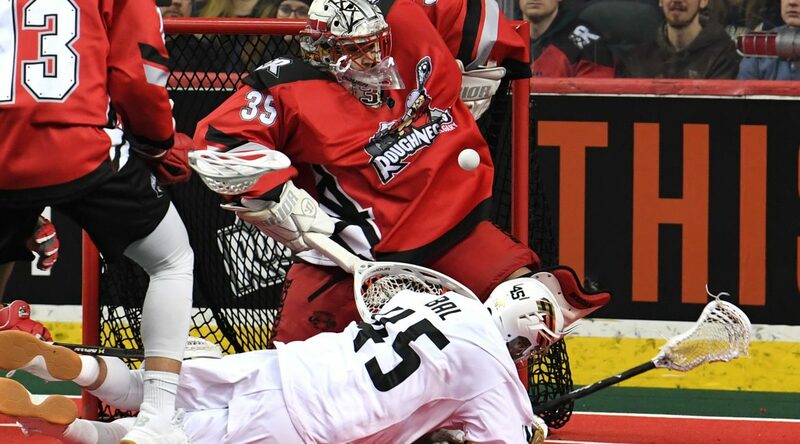 After falling behind 4-2 at 10:18 of the first quarter, the Calgary resistance – barricaded by goaltender Christian Del Bianco – proved tougher to breach than Helm’s Deep in evening their seasonal record at 4-4. “That,’’ summarized Del Bianco of his side’s sturdy defensive performance, “was unbelievable. And the best thing about it? We did it as a group, everybody working together, communicating, going as a five-man unit. “A tough game. We see these guys three times a year. They’re one of our closest rivals. On the floor, nothing personal but you want to take out the guy across from you. “Obviously, it was a tight game and (goaltender Eric) Penney was playing great for them. As a goalie, you feed off that, right. Pens is a guy I know pretty well, living back in Coquitlam, same as I do. “Not that you want bragging rights but you do want to outdo your buddy, right? He played a helluva game but I’m glad we got the win. The visiting Warriors struck on their first shot of the night, and their second but Del Bianco shrugged off the early dents. The five goals allowed tied a season low for the ‘Necks. “Jonesy (Mitch Jones) got one late there in the fourth quarter and that was their goal in three quarters,’’ said Calgary boss Curt Malawsky. “At the end of the day, there was no panic set in. “We don’t worry about Christian Del Bianco. He’s so head-strong. He’s going to the backbone of our back end. They had a couple of bombs from the outside early but our game plan was to take away shots, take away Jonesy, chase him into Row 5 if we had to do that. “We had to get back doing that, Delbs made the ones he was supposed to and some them he wasn’t. “From a defensive perspective we had 10 guys going out there. Sometimes we cut the lines down. Didn’t have to do that tonight. All 10 guys were rolling, the defensive guys were playing great. “It was a good confidence builder. You’ve got to win those tight games. Amazing game by our defence! Well done. Makes me wonder why none of them were among the three stars. Oh yeah I forgot, the stars are reserved for 17 and 44 no matter what kind of game they have.